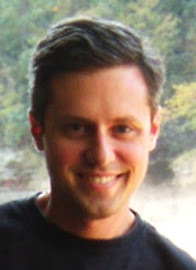 Ted Cheatham of BoardgameNews filed this video report on upcoming games at Origins 2009. Revolution made it into the first minute or so of the thirty-two minute report. You can hear Will explaining the game. Tonight, I met up with Randy from SJG during the Cincinnati leg of his great demo tour of the country. Who knows, he might be heading to your city pretty soon. 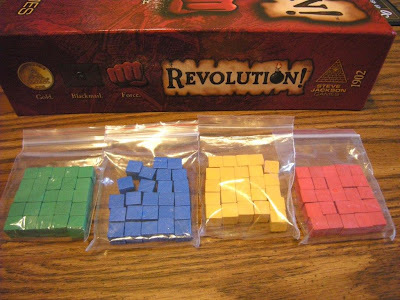 I brought along my copy of Revolution, and we managed to keep several games going during the allotted time. Thanks to Matthew Fay, owner of Yottaquest, for letting us come. I am scheming about holding some sort of celebratory / promotional event at his store during one of the upcoming board game nights (Tuesdays and Saturdays). Randy was sporting the new Revolution T-shirt (one of three). I wonder whose arm I have to twist to get one of those . . . Anyway, a good time was had by all. 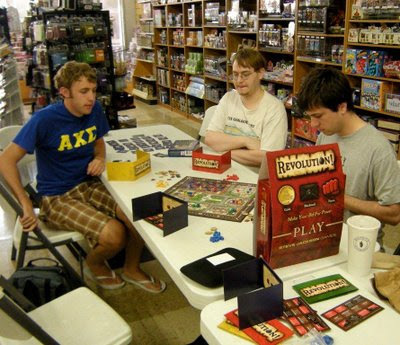 Everyone seems to like the game, even people who had come to play Magic, the Gathering, etc. 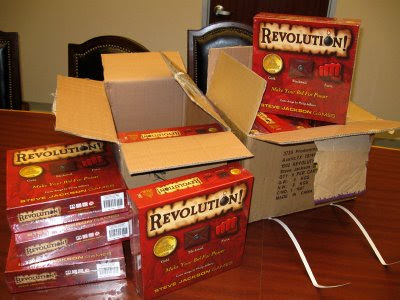 BTW - Revolution now has 29 ratings on BGG. Just one more will give it an official rank . . . I attended Origins today. I always try to go there because it's only two hours away and I get in free for being a teacher. Yay! This year I got to observe and participate in some demonstrations of Revolution! It seems to be getting a nice reception--people like it. 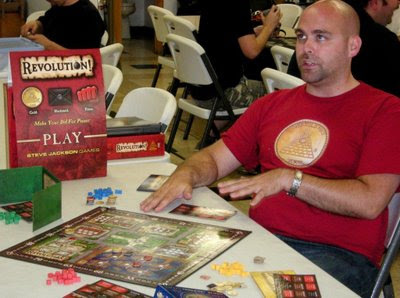 Even the "munchkin people" seem to be willing to expand their gaming horizons just enough to discover that maybe they like real board games, er, other games, too. Now all we have to do is get the "munchkin haters" on board--you know who you are. 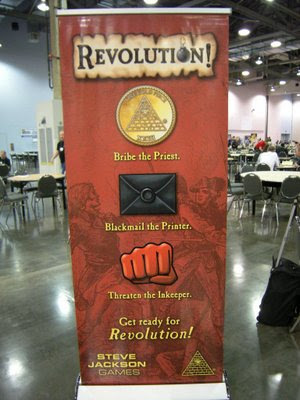 I met a particularly famous one today, Tom Vasal of The Dice Tower, and, with the help of David Miller of Purple Pawn, tried to convince him to give Revolution a try. 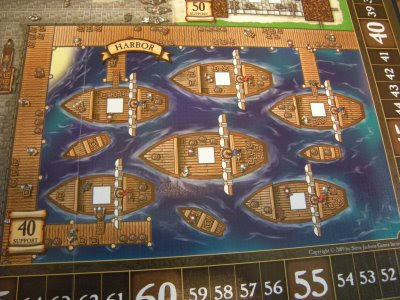 He indicated that a review copy of the game would be most welcome (hint, hint, Will . . .). 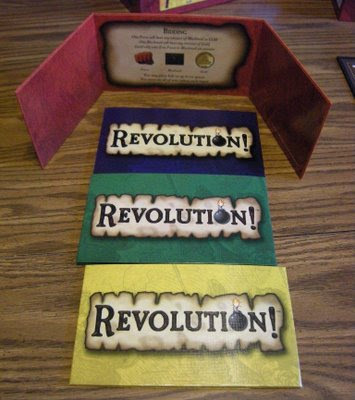 I played two games of Revolution today and came in second both times, mainly because Randy doesn't like losing without taking someone with him! I also met a few more famous people. Peter Mayhew--Chewbacca was there, although I did not technically meet him. But I did see him from a fairly close distance. And I learned how to play Dominion with David and again later with my Axis & Allies buds. What a surprisingly fun game! Not at all the Magiced-up card game I mistook it for. All in all, it was a very good day. This picture accompanied a recent update from SJG--the advance copies have arrived. I'm told that I will be getting one this week! Here is a link to the post. Also included in the update is a link to the official rules. I think they turned out very well! 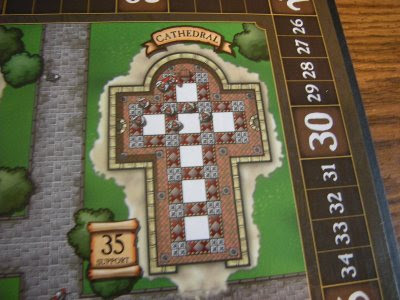 They broke the round into four phases: Espionage, Bidding, Resolution and Patronage. This does an excellent job of including all the necessary parts in an elegant way. My preferred rule about keeping losing and tied bids has indeed been included as an optional rule. 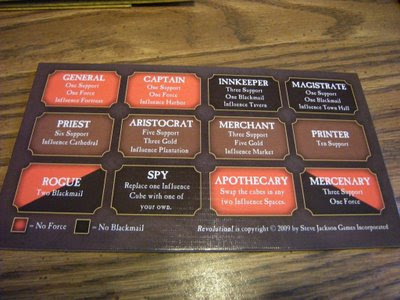 And some of you may need to check the playtester section--they included quite a few of the names I submitted. All in all, I am feeling very upbeat and ready to see how things go from here. FYI: I'm still planning to be at Origins on Friday and possibly some on Saturday. Feel free to look me up (you might try the SJG exhibitor area or the Axis & Allies play area). Revolution update: I am NOT going bankrupt. The printer will soon be loading them onto the boat. The updated release date estimate is the end of July. Soon, soon . . . It's been a while since I've posted anything, and the guilt is starting to build up. I don't exactly have much new information, but that's never stopped me before! 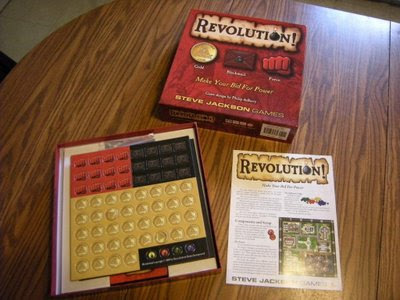 For those who don't know, Revolution should still be out sometime in mid to late June, barring any more trouble with printing mistakes or shipping containers being delayed. I recently took some interesting photos with my brother and some mean looking AR-15s. We are both wearing the Revolution shirts he made me for Christmas. There is some question has to the wisdom of posting them here, but you can see them on Facebook if you send me a friend request. I also am currently working on a few more games, though more slowly than in previous months. I currently have two prototypes sitting on publishers' shelves waiting for glory. I wonder if they are waiting to see how Revolution does before they commit. I'm pretty curious about that, too. 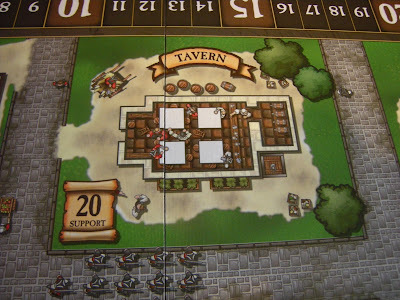 Revolution currently has 25 ratings (30 are necessary for an official rank), and BGG now offers you the chance to become a "fan" of your favorite games. Revolution currently has zero. :( Maybe you can help turn that around. I'm hoping things will get stirred up a bit once the game is finally released. For anyone whose interested, I'm planning to be at Origins (Columbus, OH) at least a day or two. Word has it that Phil Reed may be in attendance, and I would very much like to meet him. I suppose there is a chance that a few copies of Revolution will also be there. Fingers crossed! Update on the update: Phil Reed is not coming. Also, they're going to send me a copy of Revolution next week!